I had what I thought was a better-than-average job prospect, but at this stage it’s obvious it is not going to materialize, since the appointed time for a response has passed with no word whatsoever from the employer. Maybe it’s just as well, because it would have required relocating at short notice to a different part of the metro area. It wasn’t a particularly bad part of it, but still: if I must relocate at short notice, I’d rather it be to someplace in Cascadia that does not have one of the key glaring downsides that each of the major metropolitan areas here have. In other words, I’d rather get something a little extra for the pain and bother of moving. If it wasn’t for those downsides (Portland: allergen levels and general poor air quality, Seattle: poorly-planned growth that has a significant negative impact on quality of life, Vancouver, BC: onerous immigration hassles), I wouldn’t necessarily have an objection to living in a larger city. It’s just that each of the three “major city” options in the Pacific Northwest happen to have a serious downside to them. What’s the Deal with Wireless Keyboards and Mice, Anyhow? It’s not as if having a cable on my keyboard limits its usefulness in any way. Maybe the cable on my mouse does — a little. Most of the time, though, I’m completely unaware of it, too. It’s only a thin cable, not a ship’s anchor chain or anything. Meanwhile, having a wired connection to the CPU means both keyboard and mouse have electric power whenever my computer does. Wireless devices must perforce depend on batteries. Batteries that can (and do) go dead. Batteries which Murphy’s Law states will go dead at the most inconvenient times imaginable. Such as late at night when you’re out of batteries an important project is due next morning. Plus the cable keeps the mouse conveniently tethered to my computer, so I can’t inadvertently take it elsewhere and lose it. So to sum up: for keyboards and mice, Bluetooth offers little or no real advantage while imposing a very real disadvantage. I suppose there’s the odd specialized application where wires are a very real disadvantage, to the point where it’s worth putting up with the disadvantages of wireless technology for such devices. But that does nothing to explain how common wireless keyboards and mice are; it seemed that wireless mice outnumbered wired ones at Fry’s. Which begs the question: why do so many people purchase and use such obviously inferior products? The only answer I can come up with is one of technology for technology’s sake: simply because we can use wireless keyboards and mice, many people apparently think that we should. Though I must confess this rush to embrace a new technology for mice still strikes me as extremely odd, given how long those horrible trackball mice (perpetually getting dirty and needing cleaning) lingered on the market in the face of far superior optical mouse technology. Even the old-fashioned optical mice that required a special mouse pad still beat trackball mice (which tracked so poorly that virtually everyone bought a pad for them, anyhow) hands down. And even after the pad-free optical mice appeared on the scene, it still took nearly a decade for trackball mice to finally end up in the dustbin of history where they belong. Really, it’s amazing how crappy computer keyboards generally are. I was just at Fry’s getting the capacitor I’m going to try replacing, and had a chance to try out their keyboard selection. The dominant “rubber dome” technology provides absolutely horrible tactile feedback: the electrical action takes place after the main mechanical action that one feels. Therefore, the only recourse if you want to type quickly is to bang on the keyboard like crazy, to ensure each key stroke hits home and causes a character to be entered. This causes fingers to get much more tired than they need to, because one is exerting on average far more force than one needs. The only keyboard technologies that provided proper tactile feedback were ones made using IBM’s “buckling spring” technology (which I think is the best), and some mechanical keyswitches (which can get pretty darn good, too). Every subsequent technology has had no advantages for the user whatsoever: the only advantages newer keyboard technologies have has been for the manufacturer’s drive to cut costs. What astounds me is not that the cheapest keyboards feel like crap (one would expect that, you’re getting pure “dollar engineering”), but how many keyboards with $100-and-up price tags (even ones advertised as “ergonomic”) also felt like complete crap when I tried them. Making a fancy curving layout so one’s hands can be held at a natural angle but using a technology that forces (at the cost of failing to enter the random character) users to use unnecessary force is like having a restaurant that serves a turd as dessert, but frosts it elegantly in icing and serves it on a sterling plate. The only keyboards that weren’t absolute crap were two models by Razer geared towards the gamer crowd. While spendy, they were still less expensive than many of the crappy ones. My expensive Unicomp keyboard has been acting up as of recently. For a few hours this afternoon I thought I had fixed it simply by reseating a loose connector inside the keyboard itself. Now it’s acting up again. I’m going to try replacing the one electrolytic capacitor in the thing, even though it looks OK, just on the off chance it is infested with capacitor plague. But at this stage I’m decidedly pessimistic about its prognosis. Everything else on the thing is a surface-mount component, and the most likely culprit is the single proprietary IC on the logic board. Meaning that it’s probably replacement time. Update: Yup, definitely replacement time. Just tried replacing the capacitor, and the quirky behavior remains. The up to 34% greater efficiency cited for them is a bogus number if you live in a cool climate where the energy you consume heating a home is significantly more than that spent cooling it. Most of the heat energy wasted by a tankless heater literally goes down the drain. In contrast, most of the energy “wasted” by a tanked heater escapes to the environment around the tank. Since the heater is almost always in an interior space, this means that during the heating season, that energy is not, in fact, “wasted” at all — every therm of natural gas a tanked heater ends up spending on heating its surrounding environment is a therm of natural gas the furnace does not have to consume toward that same end. If you live someplace like Texas where energy consumed on cooling dominates, then it’s the other way ’round, of course. But for those of us that live in cool climates (I live in a place where the vast majority of residences do not even have air conditioning), the efficiency gains of tankless heaters (which we have already established are mostly bogus even without this latest insight) are perforce inflated. How Wasteful are Tankless Heaters? First, Wikipedia states that a navy shower can use “as little as” 3 gallons of water, while leaving the water running can use “as much as” 60 gallons. So, in the best case (this is important), a Navy shower uses 1/20th the water as leaving the water running. Second, according to the US Green Building Council, a tankless heater can heat water as much as 34 percent (again, another best case) more efficiently than a conventional tanked one. Now, let’s give tankless heaters the benefit of the doubt here: We’ll compare the two best cases, and then weight the comparison in favor of tankless heaters by ignoring how much more water one sends down the drain while adjusting the temperature. That’s right, a tankless heater is nearly fifteen times more wasteful than an old-fashioned tank-style heater if you’re already used to taking a navy shower (as I am; in fact, I prefer it). I’ll repeat that: fifteen times. Not fifteen percent more wasteful, fifteen times. An order of magnitude. If you’re not already taking navy showers, you can therefore save far more energy just by changing your usage habits than you can by changing your water heater (and I’m not even including the energy cost of manufacturing and transporting the new water heater in this). Wow, just slightly over twice as wasteful. I’m so… impressed. Given the choice, I’ll stick with with an old-fashioned tank, thank you very much. Tankless water heaters probably do not save much energy, either. And may actually even waste it [update: they almost certainly do, see next article] compared to conventional tanked heaters. In short, they are generally overhyped. After having coped with one for a little over six months, I think I am qualified to make those statements. When I first took a shower in my current residence (which has such a heater), I was astounded at how much water I had to first run down the drain before it got the least bit warm. For a moment, I even thought the water heater had just broke, then I realized that not only does a tankless heater have to warm the pipe between the fixture and the heater (the reason you have to let the water run with any type of water heater), it also has to first warm up the water heater itself. Then I learned to my shock that one can’t start showering and incrementally adjust the temperature as the pipe warms up further. Tankless heaters operate in a very delicate and easily-disturbed equilibrium. Adjust the flow of either the hot or the cold water, and you disturb that equilibrium, and it takes almost as long to regain it as it did for the water to get warm in the first place. So you have to let more water run down the drain — heated water, this time — until the hot water running down the drain has reached its maximum piping-hot temperature. Then you start adjusting the temperature. This takes significantly longer than doing so with a tanked heater, because each time you touch a faucet, you disturb that delicate equilibrium and have to wait for the temperature to stabilize again (typically it will oscillate after you make a change). During that time, you send even more heated water down the drain. If you don’t, you will find yourself being scalded or frozen by a temperature fluctuation. And forget about taking a “navy shower” to save water. If you shut the water off to lather up, you have just destroyed the delicate equilibrium you spent so much time and water creating. You’re better off just letting the water run and pushing the shower head to the side so more heated water gets sent down the drain while you soap up, because that will waste less water and energy than starting the process from scratch again. And it’s not just during showers. Want to quickly wash a few dishes? You’ll send several times more cold water down the drain than with a tanked heater. Going to wash another dish after that? Better just leave the water running, because if you turn it off you’ll destroy the equilibrium, the water will get cold in the middle of that second dish, and you’ll waste at least as much water letting it run and warm up again as you would if you didn’t turn the faucet off. Somehow, I have the sneaking suspicion that the calculations which show tankless heaters saving energy don’t take into account how the different usage patterns they force cause so much water (mostly heated water, at that) to get sent down the drain, unused. If I were building a “green” house, I’d focus on other solutions, like super-insulating the water tank and putting it on a timer, to minimize energy usage. I bet it wouldn’t be hard to beat a tankless heater with such strategies, simply because I’d be sending far less hot water down the drain. 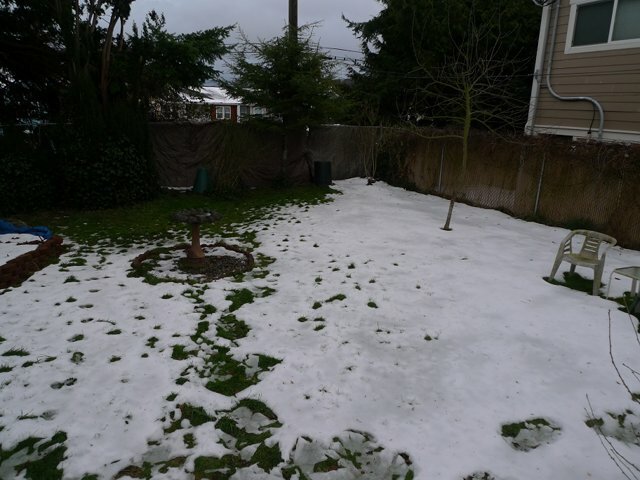 Back yard as of yesterday morning, as the grass was starting to show. Snow is now almost completely gone. When snow melts here, it tends to melt fast compared to more continental climates. Our winter mildness is driven by marine influence, not ample sunshine. When temperatures normalize, they stay above freezing day and night. Our thaws don’t happen incrementally in daylight hours only, they go on 24/7, often with winds and rain to expedite the process. There is also no thick layer of frozen ground to slow down the melting. Because the ground seldom freezes deeply, the grass is green when the snow melts. I remember I once had a dream while in my teens of snow melting to reveal green grass, and I thought it unrealistic, because everyplace I had lived where it could snow always had brown grass in the winters. Not here. 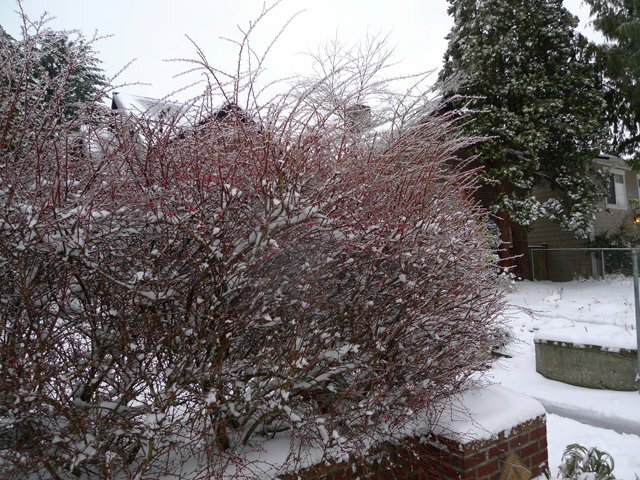 Ice-glazed shrubs in front of the house this morning. Last night’s freezing drizzle intensified through the night, becoming mixed with sleet. From 1/3 to 1/2 inch of ice accumulated, depending on whether you measure it on twigs or on flat surfaces. Around 2:15 this afternoon, the sleet changed back to light snow. Sometimes, it’s hard to forecast when the arctic air will finally get scoured out, and apparently this is one of those times. I really think it’s going to end tonight or tomorrow morning, though: the outflow winds that have been feeding us cold air from the Fraser Gorge via Bellingham have really collapsed this evening. But sometimes storm systems have a way of reviving declining arctic outflows: arctic air has high pressure, and storms have low pressure, and the wind blows from high to low. However, it’s noteworthy that this is the first time the northerly winds have abated since this storm began (they never did abate yesterday evening, which made me doubt that I’d awaken to a thaw this morning). The mild marine air always wins in the end, the only question is when. It’s still been a surprisingly tenacious and strong storm for a place with a mild marine climate, even if the snow totals weren’t as whoppingly huge for us as forecast (though they certainly were whopping to the south).